A cute series of ads running on TV these days shows a regular person—a guy at the gym, or a barber, or a housewife—speaking in a voice that clearly doesn't belong to that person. A black guy at the gym will have the voice and accent of a Valley girl, or a white housewife will sound like a Japanese teenager. The ads are intended to raise awareness of the new phenomenon of "identity theft" and a particular credit card that claims to insulate its customers from such a crime. The premise is that there is nothing more valuable to you than your own identity. It's not just a matter of a stranger running up bills on your credit card; it's a matter of a stranger saying things or doing things in your name that may haunt you for years to come. Suppose you decided to run for public office some day and it turned out that a thief using your name had accepted bribes from jack Abramoff? Suppose you decided to buy a piece of property and learned that someone else, using your identity, had been foreclosed? Suppose you decided to get married and discovered that someone else, using your identity, was already married to another person entirely? 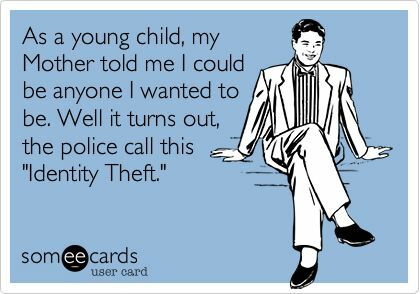 We in America, however, are facing a much more serious kind of identity theft. This kind of identity theft leaves millions of Americans without an identity, and without a voice. And it may already have happened to you. As everyone knows, America's political system has two major parties, Republican and Democrat. You can talk to anyone and ask what these two parties stand for. Most Republicans will say that their party stands for fiscal responsibility, smaller government, less government intrusion into our lives. Most Democrats will say that their party stands for environmental and social responsibility, smaller government, but a recognition that the government is sometimes needed to prevent bullying corporations from stomping on the ordinary citizen. At this point in time, both the Senate and the House of Representatives have a Republican majority, which means they can pass any legislation they can agree on. So we should have a fiscally responsible, smaller, less intrusive government, right? After all, they've had since 2000 and a Republican president to turn things around, haven't they? But wait. We've gone from a budget that was balanced in 2000 to one that is trillions of dollars in debt. Government is larger than ever, and recent revelations regarding the NSA show that the government is intruding into our lives to an unprecedented degree. Democrats, who traditionally view Republicans as "the enemy", shrug their shoulders. But a person isn't born Republican. It isn't in the genes. So when is a Republican not a Republican? When he or she doesn't act like a Republican, of course. And that's a pretty fair description of virtually all the so-called Republican officials of the current Administration. They call themselves Republicans, but they are not Republicans. Similarly, we have another label, Conservative. Conservatives are considered "right wing" to the Liberals' "left wing". While Republicans are traditionally Conservative, there's no rule connecting the two. You could also have a Conservative Democrat, or a Conservative with no interest in politics at all. Conservatives are people who believe in preserving what they have. Traditionally, they are not risk-takers. Social conservatives are people who want to preserve current social and cultural conditions, such as miscegenation laws or heterosexual marriage. Depending on his or her age, a musical conservative might approve of rock but not rap, or Baroque but not Rococo. Liberals, on the other hand, believe that change is good and are willing to risk what they have in the present to create a better future. Social liberals ended slavery and would let any individuals marry who wish to. Lincoln, a Republican, was a social liberal. However, you would never guess these definitions if you came here from Mars and your first exposure to Earth was the Rush Limbaugh radio show, or the Sean Hannity TV program. These people, who claim—loudly—to be "conservatives", demonstrably don't know enough history, much less facts, to be able to conserve anything. Instead, they use their air time to tell lies about liberals (and Democrats) and anything else that will incite a culture of rage to get upset enough to call in. There is nothing conservative about Rush Limbaugh, who speaks the Conservative words of "drugs are bad" but can't shake an addiction to them. There is nothing conservative about Sean Hannity who says that NSA wiretaps on our phones are a good thing. A true conservative would never risk our hard-won Bill of Rights for a short-term expedience. But, again, liberals, who think of conservatives as "the enemy", have only the likes of Limbaugh and Hannity to judge conservatives by. To a liberal, Rush Limbaugh is a conservative. And thus, real conservatives have had their identities, and their collective voice, stolen. We may not like labels but we use them. Life's too short to try that stalky green vegetable a thousand times. By naming it "broccoli" you can decide if you like it once and for all. "Republican" and "Democrat" may be shallow starting points for understanding a political position, but they are starting points. If someone says, "I'm a Democrat but I believe in gun ownership," he or she has saved an hour of explaining his or her political philosophy. "Conservative" and "Liberal" are likewise shallow, but as starting points they can jumpstart a conversation. That's what labels are for, and that's all they should be for. The rest of the conversation should be held to get to know individuals in all their nuance. If the conversation lasts long enough, the labels should quickly become irrelevant. But identity thieves like Bush, Frist, Limbaugh and the rest have broken that whole mechanism. Now, if a person tells me, "I am basically a Conservative," my first thought isn't that he wishes to preserve what he has, but that he can't get his facts straight and only wants to trash Liberals. If he tells me he's a Republican, I immediately gird myself to defend my right to marry whom I please. These are not appropriate responses to "real" Conservatives or Republicans; but thanks to the loud voices of the identity thieves, they are the responses they get. If you and I were to start a conversation on politics and I said, "I'm a tree," being unfamiliar with the term, you'd probably insist on my explaining from square one where I stood on various issues. But when I say, "I'm a Republican," you think you know. And everything I say from then on, will reach you through the filter of what you think a Republican is. Will that image be of a fiscally responsible manager, or of a profligate spend-thrift with delusions of grandeur? That's the danger of identity theft: It actually makes it more difficult to understand each other, because we always listen through the filters of our labels. But the worst identity theft of all is that of religious extremists who call themselves "Christian". These are people who are intolerant, racist, homophobic, and who are in favor of war, torture, and the imposition of their way of life on the rest of us. When Fox News wants a "Christian" point of view, they bring on one of these extremists to give it. Whenever we hear of "moral" controversies such as those over abortion or teaching evolution in schools or school prayer or who, exactly, should be allowed to marry—it is, in fact, not the bulk of American Christians but the Christian extremists who are behind these controversies. The identity theft is so complete that the rest of the Christians in the country—the real Christians, the ones who try to follow the teachings of Christ—have resorted to calling themselves "mainstream Christians" in self-defense. Usually it's the minority who have to use additional descriptors: "male nurse," "woman doctor," "conscientious objector." But the majority of American Christians have been driven to call themselves "mainstream" in order to distinguish themselves from their violent, extremist cousins. And because these "mainstream" Christians have been marginalized by the minority, they are rapidly losing their voice. Recently the Church of Christ was not allowed to run pro-diversity ads on television. The TV networks they asked refused them on the basis that "Christians" would find them offensive. This theft of identity has resulted in a tyranny of the minority. An unexpected problem, to be sure. But then, no one ever expects the Spanish Inquisition. I see only three possible outcomes of this trend. One, we can do nothing and lose true Republican, Conservative, Christian ideals to the corrupt, simple-minded and perverted ways of the identity thieves. Two, the Republicans, Conservatives and Christians might each choose new words to describe themselves—but this only begs the question, because there's nothing to stop the thieves from simply doing it again. The third possibility is for the Republicans, Conservatives and Christians to take back what is rightfully theirs. But it will require every member of each group to insist, even more loudly than the thieves, on their right to those words. Whenever a "Republican" says, "We need a massive new governmental program to deal with natural disasters," every real Republican within shouting distance should cry out, "That's not a Republican thing to say! Republicans believe in small government! You're no Republican!" Whenever a "Conservative" says, "The president doesn't need a warrant to wiretap American citizens," every real Conservative within shouting distance should cry out, "That's not a Conservative thing to say! Conservatives cherish the Bill of Rights! You're no Conservative!" And whenever a "Christian" says, "There must be prayer allowed in school," every real Christian within shouting distance should cry out, "That's not a Christian thing to say! Jesus said to pray in private. You're no Christian!" Maybe, just maybe, if we are louder than they are—and we can be; there are more of us!—they will be forced to find honest words to describe themselves and find a balance and a way to participate in the greater society without impostering themselves into more influence than they deserve. The United States is horrifyingly close to becoming a police state, and most of the populace still has no clue; because they haven't questioned the misuse of words like Republican, Conservative and Christian. This shouldn't surprise anyone who grew up with the words "New and Improved!" slapped on every box and label, but it's happened, nonetheless. Taking back our words is the first, necessary battle in taking back our country. Because allowing these people to steal the identity of America in our names, is just wrong.